Since the mid-19th century good hand hygiene has been recognised as an effective means of controlling the spread of infectious diseases and bacteria. More recent years have seen a growing awareness of the important role hand drying plays in good hand hygiene. This is largely because the transmission of bacteria is more likely to occur from wet skin than dry. So we know hand drying is important but is there a ‘better’ way to dry them? Warm air hand dryers and cloth towel dispensers are both familiar fixtures in public and workplace bathrooms, but is one better than the other? Fortunately some bright sparks out there have put in the hard work needed to provide us with some answers. Continuous cloth towel dispensers act to isolate bacteria, with the used section of towel encased in a dispenser, where it remains undisturbed until it is time to remove the towel roll for cleaning. 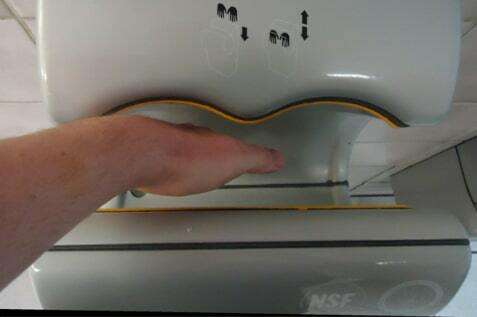 Warm air hand dryers, on the other hand, not only increase bacterial contamination of hands but also spread contamination by blowing bacteria up to a 2-metre radius from the dryer. Clean hands are important and it seems that using cloth towels is a better way of ensuring that cleanliness. I’m not so sure, however, that continuous cloth towels are as useful for drying your hair. So if you are thinking about this soft, absorbent, hygienic, eco-friendly way of drying hands for your workplace, think no more! We mean, all you need to do is give a call, and Alsco’s friendly representatives will be happy to help you! ‘A comparative study of three different hand drying methods: paper towel, warm air dryer, jet air dryer’ by Keith Redway and Shameem Fawdar of the School of Biosciences, University of Westminster London.